Bruno Fischer was an American pulp writer and journalist who also wrote short stories (and one novel) under the name of Russell Gray. He was born in Germany but emigrated the US with his family in 1913. He was educated at the Rand School of Social Sciences, and married Ruth Miller in 1934. The first short story he ever sold was of the horror genre… “The Cat Woman” (1936). 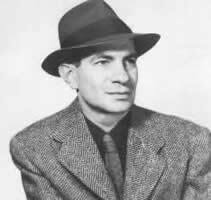 He produced detective short stories from 1940 to 1962, then switched to a continuing series of novels. CLICK HERE FOR MORE BOOKS BY BRUNO FISCHER. It was horror writer David Bischoff, writing in Jones and Newman's excellent overview volume Horror: Another 100 Best Books who first turned me on to Bruno Fischer's House of Flesh (1950). In his essay, Bischoff mentions that House of Flesh is a "Gothic novel for males," reveals that it is his favorite "shudder pulp horror" story, and tells us that this little novel surprisingly sold over 2 million copies in North America alone. The edition that I read is the hard-to-find original Fawcett "Gold Medal," but I'm very happy to see that the fine folks at Blackmask have released a new edition for a 21st century audience, as House of Flesh is an exciting page-turner that should please most readers... and not just males. While not exactly horror per se, it does contain some gruesome elements, and can be said to be more of a noirish tale with decidedly shuddery overtones.